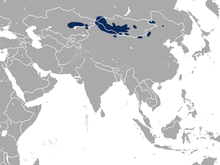 Pallas's pika (Ochotona pallasi), also known as the Mongolian pika, is a species of mammal in the pika family, Ochotonidae. It is found mainly in the mountains of western Mongolia. There are four subspecies: O. p. pricei, O. p. hamica, O. p. helanshanensis and O. p. sundica. One notable difference is that O. p. pricei generally dwells in dry steppe habitats and may build burrows while the other subspecies tend to prefer rocky habitats. However, none of the subspecies live strictly in either sort of habitat. Like other pikas, Pallas's pika is herbivorous and saves grass in the summer to eat in the winter. It often constructs haypiles with this stash, but some populations prefer to keep their stores under rocks. Pallas's pika usually has several litters of between one and thirteen offspring during each mating season. Mating habits may vary based on the population size in the area that year. As a species, Pallas's pika is common. However, O. p. hamica, O. p. helanshanensis and O. p. sundica are rated as "critically endangered" and "endangered", respectively, on the IUCN Red List. ↑ Hoffman, R.S. ; Smith, A.T. (2005). "Order Lagomorpha". In Wilson, D.E. ; Reeder, D.M. Mammal Species of the World: A Taxonomic and Geographic Reference (3rd ed.). Johns Hopkins University Press. p. 191. ISBN 978-0-8018-8221-0. OCLC 62265494. ↑ Smith, A.T. & Johnston, C.H. (2008). "Ochotona pallasi". IUCN Red List of Threatened Species. Version 2008. International Union for Conservation of Nature. Retrieved 10 April 2009. Database entry includes a brief justification of why this species is of least concern. Grzimek, Bernhard, ed. "Pallas's pika". Grzimek's Animal Life Encyclopedia. 2nd ed. Vol. 16. Detroit, MI: Gale, 2003. 499-500.